... when you're having fun - or so the saying goes. It's amazing to me how fast days can go by, especially at this time of the year. Without realising it November has almost passed completely by and I've barely even scratched the surface of my four things challenge. 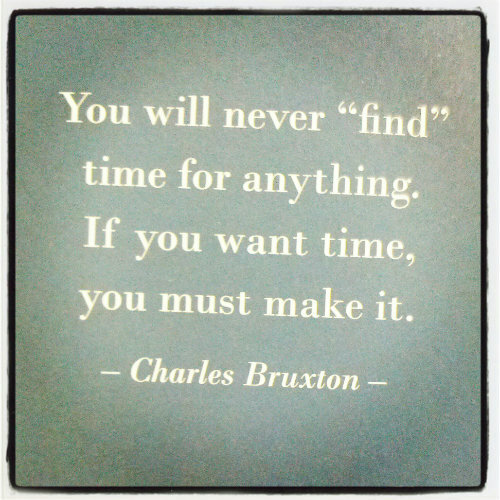 It wasn't until I read this quote from Charles Bruxton - brewer, philanthropist, writer and Member of Parliament - that I realised how much time had slipped by this month. Reflecting back on my four things - stretching, writing, creating and walking - I realised I haven't fully achieved my goals in every area. I've succeeded the most at walking, and to a lesser degree (about 50%) in creating and writing. Stretching, sadly, has been almost non-existent outside of my training sessions. Rather than look on this as failure I'm choosing to reflect back on my results as an indication of where my priorities have laid this month - the things that I have valued - and thus where I have spent my time. I've had a busy year and I've been really trying to safeguard my health recently so that I can finish the year strong. My success in spending my time on walking certainly reflects this inner priority, as does my increased craft efforts as they serve as a mental balance for the work I do. When I start thinking about December and what I want to achieve I want to first stop and evaluate what are my inner priorities right now. What are the things inside that I know I need to do as opposed to the things I want to do. If I focus my energy on my needs rather than my wants will I more readily reach my goals because I have a stronger desire to make time? How to I event begin to know what I need rather than focusing on what I want? I'm going to spend the rest of this week pondering needs vs wants and set aside some time (make time) on Sunday to reflect on this. I think if I can align my goals with my needs I'm sure to make time for success. Needs vs wants... a challenge as I speak as I have so much to do planning for my bright future after years (decades) of delays, setbacks, and "work arounds".